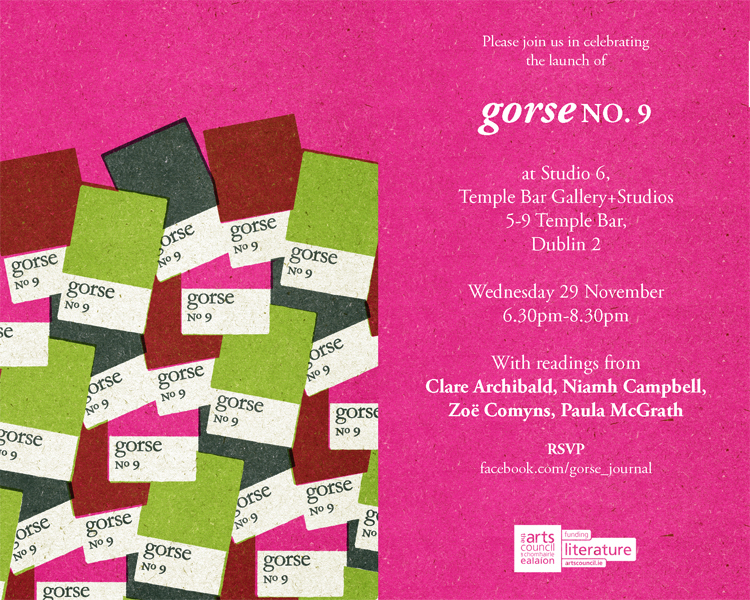 Please join us in celebrating the launch of gorse No. 9, on Wednesday 29 November 2017, in Studio 6 at Temple Bar Gallery + Studios, with readings from the issue by Clare Archibald, Niamh Campbell, Zoe Comyns, and Paula McGrath. Free to attend, refreshments available. CLARE ARCHIBALD is a Scottish writer interested in the interplay of form and the potential of collaboration. She has previously been selected to read at Edinburgh International Book Festival Storyshop, and long listed in the Lifted Brow Experimental Nonfiction Prize. NIAMH CAMPBELL is a recipient of the Irish Arts Council ‘Next Generation’ bursary award, and currently works as a postdoctoral fellow at the University of Maynooth. Her work has appeared in The Penny Dreadful, Banshee, and The Dublin Review. ZOE COMYNS runs an independent production company which produces The Book Show and Inside Culture for RTE Radio 1. She has written a number of radio plays including Flights of Fancy (New York Festival’s Best Writing Award), Another Blooming Day (PPI Best Drama), Potbelly, and Scene From a Distance (Ake Blomstrom Award, New York Festival Best Narration). PAULA McGRATH’s novels are Generation (2015) and A History of Running Away (2017), both with John Murray. She is currently working towards a PhD at the University of Limerick.